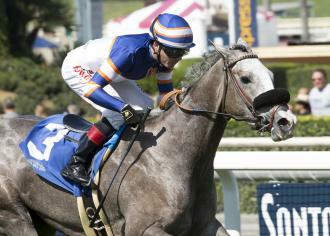 ARCADIA, Calif. – It seemed to take longer to get Enola Gray (Grazen) settled for her winner’s circle photo than it did for the 3-year-old filly to win Saturday’s $100,000 California Distaff on the hillside turf course at Santa Anita. Enola Gray started on turf for the first time in the California Distaff, for statebred fillies and mares, and took to the surface quickly, winning by a length in 1:11.57 under jockey Tyler Baze. Sent off as the 8-5 favorite, Enola Gray dueled with 10-1 Desert Steel through the first half-mile and repelled a challenge from Home Journey in the stretch to win by a length over Desert Steel. Home Journey faded in the final sixteenth, and was beaten a head by Desert Steel for second. Home Journey finished 9 3/4 lengths in front of Out Ofthe Ordinary, who was clear of Long Hot Summer, the 6-5 favorite. Long Hot Summer, trained by D’Amato, was never a factor under jockey Joe Talamo, and was last of five. Enola Gray has won 4 of 5 starts and earned $304,100. She won her three starts, including two stakes for statebred 3-year-old fillies – the Melair Stakes at Santa Anita in May and the Fleet Treat Stakes at Del Mar in July. She was second in the Robert Lewis Stakes for 3-year-old fillies at Los Alamitos on Sept. 11 in her first loss. D’Amato said owner and breeder Nick Alexander convinced him to try the turf with Enola Gray, who is by Grazen. D’Amato said he considered a turf race earlier this year, but “put it out of my mind” when the filly won her first three races. Enola Gray is likely to return to dirt for her next two scheduled starts – the Betty Grable Stakes for California-bred fillies and mares at seven furlongs at Del Mar on Nov. 13 and the Grade 1 La Brea Stakes for 3-year-old fillies here on Dec. 26.